The illustrious green jacket is back on the shoulders of Tiger Woods for the first time since 2005. After battling the likes of Dustin Johnson, Brooks Koepka and Xander Schauffele all day, Woods won the whole damn thing with a score of -13. As if everything that had been building to this moment wasn’t enough to make it special, it was his first time he had won a major while trailing going into Sunday. The victory at Augusta National not only signaled the end of his drought of winless majors, but it also meant something so much bigger: validation of a career comeback. Tiger is no longer just the sport’s washed up uncle that only plays during the rare moments when his back is working like it’s supposed to, he’s a goddamn champion again. More than that, Tiger is a Masters champion again. The win was officially clinched with a bogey putt in the 18th hole. 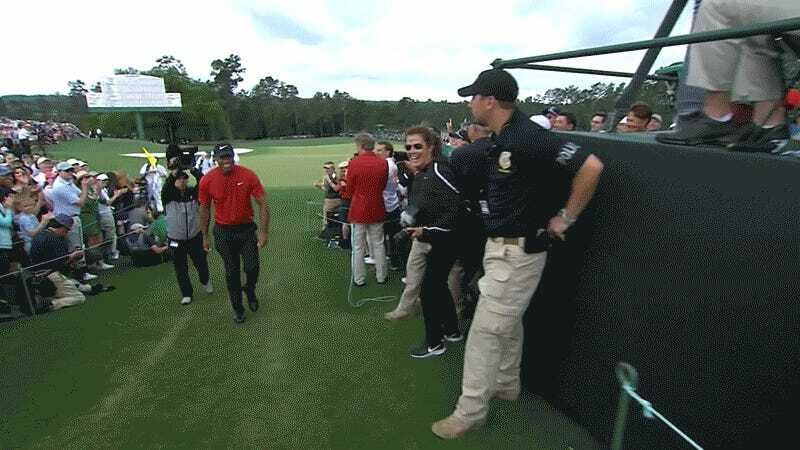 The emotions were understandably flowing through Woods’s head shortly after that moment of glory. That kind of reaction should be a surprise to no one. Tiger is only two years removed from his spinal fusion surgery (his fourth back surgery) along with a DUI arrest and a stint in rehab that followed shortly afterwards—and those are just the issues he’s had to deal with over the last couple years. Since then, many golf fans had held on to every momentary lead, under-par score, and swing where he didn’t suddenly crumble into ash as a sign that he might be back. But the hype surrounding his return to form had always been dismissed as a pipe dream. Not only had many assumed he’d never be as good as he once was again, but some even went so far as to believe that he’d never play again. Hell, that second fear was something he even said publicly. To come from an era of one’s career that seemed like never-ending darkness and emerge on the other side as a champion of golf’s most prestigious tournament is nothing short of inspiring. Golf is good again because Tiger Woods is a champion again.